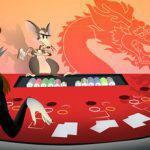 Online Red Dog is a very simple yet rare new casino game for some players, played with two decks of cards. It is very much like other basic card games like “In Between” and “Acey Deucey.”. Playing Red Dog online can be a very electrifying experience. The rules to play online Red Dog are very simple. The value for the cards is decided based on the number on the card. 2’s through 10’s are scored on their face-value. Jacks have 11 points, queens have 12, kings have 13 and aces count as 14. The cards are reshuffled after every session. You start by placing a bet first. Then the dealer deals 2 cards to you. If the cards dealt are consecutive, then the game is a push because there’s no spread. The spread is the value range between the initial two cards drawn out. To illustrate, let’s imagine, you draw 2 cards: a 6 and a 10. three cards, numbers 7, 8, and 9, fall between a 6 and a 10, so the spread here is 3. But suppose you draw a 2 and a 3. In this example, there is no range between these two numbers, so there’s no spread. When you draw 2 consecutive numbers, it calls for a ‘tie.’ At this point the game is a push. You get your wager amount back. The hand comes to an end and the option to raise your bet is closed. But if you draw alternate cards, then the dealer declares the spread. Now you can raise your bet if you want. Otherwise, the dealer will deal you with the third card. If your third card holds a value that falls between the initial 2 cards, you win even money on the bet you made. 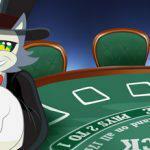 You hit the bull’s eye on Red Dog online if you draw 3 cards with equal value. It gets you an amount 11 times the bet you place. The pattern of buttons that puts online Red Dog in action is very easy. To begin with, just click on the chips you want to bet. Then set the game in motion by clicking the ‘Deal’ button which will deal you two cards face up. If you wish to raise your bet, click on ‘Raise’ option. Otherwise, click on ‘Continue’ to draw the third card. Doubling your bet amount when the spread is 7 is the only strategy which can help you get the best out of the Red Dog online. At spread of 7, all the 7 cards increase your odds to win. But even if you lose, you lose at the hands of 6 cards only. All efficient players use this tip to make their prospects of wining stronger at online Red Dog. 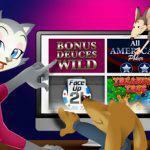 The payouts on Red Dog online are very straight forward. You get even money on winning the first bet. But the payout for the raise bets is determined according to the range of spreads. When the spread is 1 the payout offered is 5:1; for a spread of 2, the payout offer is 4:1; for 3, it is 3:1 and if it is 4+ the payout is 1:1. But if all three cards drawn are equal, the payout is 11:1. What are you waiting for? Download online Red Dog now! 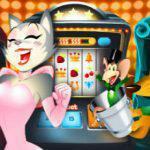 And enjoy gambling at CoolCat Casino with the 98.5% payout odds. The margins, however, can be modified for our VIP customers.